The law, if approved, is more about public education than prosecution, officials said, citing the impact balloons have on the landscape and wildlife. East Hampton Town is considering a ban on the intentional release of balloons in an effort to reduce pollution and protect the wildlife that often ingests them. The proposed legislation lists balloons made from materials such as rubber, latex, polychloroprene or nylon fabric, assistant town attorney NancyLynn Thiele said during a town board work session Tuesday. The ban would apply to balloons filled with helium, hydrogen, nitrous oxide, oxygen, air or water. The town would not enforce the law against anyone who accidentally lets go of a balloon, Thiele said. “We’re not going after 3-year-olds who can’t hold onto their parade balloon,” she said. Town officials could use circumstantial evidence, such as a note tied to a discarded balloon, to enforce the law, but the primary purpose of the legislation is education, not prosecution, Thiele said. Weather balloons, hot air balloons and balloons released indoors would be exempt from the law, Thiele said. Water balloon fights would still be permitted, “as long as you pick them all up,” she said. Violators would face up to a $1,000 fine or up to 15 days in jail. Suffolk County law currently only prohibits the intentional release of 25 or more “lighter-than-air” balloons. Sandra Morelli, owner of Hampton Balloon party rentals, said she agrees the release of Mylar balloons, which are made from nylon, should be banned, but said some latex balloons are biodegradable and can be released responsibly. Morelli said she usually gets requests for balloon releases once or twice a year for weddings and funerals, particularly funerals for young people. Rob DiGiovanni, chief scientist at the Atlantic Marine Conservation Society, said the plastics sometimes end up consumed by marine life. He noted that latex balloons do not immediately biodegrade, citing a deflated Father’s Day balloon he spotted during a survey last August. “It’s not as if it dissolves upon impact,” DiGiovanni said. East Hampton Town trustees, a separate nine-member governing body charged as the stewards of some public lands, last month passed a resolution in support of the ban. 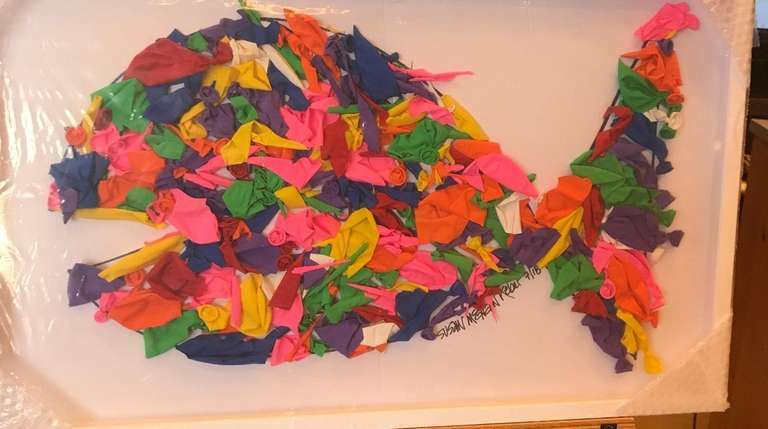 Earlier in the work session trustee Susan McGraw Keber presented a piece of artwork she crafted with discarded balloons collected throughout town to highlight the issue. "There's no reason to send 25 balloons up into the air," she said. A public hearing on the proposed ban is expected to be scheduled for Feb. 7.